Scientists are keeping a close eye on a big asteroid that may pose an impact threat to Earth in a few decades. Talk about the asteroid was on the agenda during the 49th session of the Scientific and Technical Subcommittee of the United Nations Committee on the Peaceful Uses of Outer Space (COPUOS), held earlier this month in Vienna. A UN Action Team on near-Earth objects (NEOs) noted the asteroid’s repeat approaches to Earth and the possibility — however remote — that 2011 AG5 might smack into our planet 28 years from now. Gravity Simulator image of 2011 AG5 passing the Earth-Moon system in February 2040. Earth is the blue dot, the moon’s orbit is gray, and 2011AG5 is green. Simulation created with JPL Horizons data. "2011 AG5 is the object which currently has the highest chance of impacting the Earth … in 2040. However, we have only observed it for about half an orbit, thus the confidence in these calculations is still not very high," said Detlef Koschny of the European Space Agency’s Solar System Missions Division in Noordwijk, The Netherlands. "In our Action Team 14 discussions, we thus concluded that it not necessarily can be called a ‘real’ threat. To do that, ideally, we should have at least one, if not two, full orbits observed," Koschny told SPACE.com. Koschny added that the Action Team did recommend to the NEO Working Group of COPUOS to use 2011 AG5 as a "desktop exercise" and link ongoing studies to the asteroid. "We are currently also in the process of making institutions like the European Southern Observatory aware of this object," Koschny said. "We hope to make the point that this object deserves the allocation of some special telescope time." The near-Earth asteroid 2011 AG5 currently has an impact probability of 1 in 625 for Feb. 5, 2040, said Donald Yeomans, head of the Near-Earth Object Observations Program at NASA’s Jet Propulsion Laboratory in Pasadena, Calif.
"Fortunately, this object will be observable from the ground in the 2013-2016 interval," Yeomans said. In the very unlikely scenario that its impact probability does not significantly decrease after processing these additional observations, "there would be time to mount a deflection mission to alter its course before the 2023 keyhole," he added. Keyholes are small regions in space near Earth through which a passing NEO's orbit may be perturbed due to gravitational effects, possibly placing it onto a path that would impact Earth. 2011 AG5 may zip through such a keyhole on its close approach to Earth in February 2023, which will bring the asteroid within 0.02 astronomical units (1.86 million miles, or 2.99 million kilometers) of Earth. One astronomical unit is the average distance between Earth and sun, which is approximately 93 million miles (150 million km). According to a JPL estimate, the 2023 keyhole — through which 2011 AG5 must pass in order for there to be a real chance of an Earth impact in 2040 – is roughly 62 miles (100 km) wide. 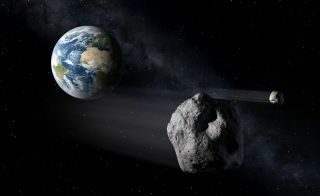 "Although this keyhole is considerably larger than the Apophis keyhole in 2029, it would still be a straightforward task to alter the asteroid’s trajectory enough to miss the keyhole – and hence the impact in 2040," Yeomans noted, referring to the asteroid Apophis, which could threaten Earth in 2036 if it zips through a keyhole in 2029. "The prudent course of action is then to wait at least until the 2013 observations are processed before making any preliminary plans for a potential deflection mission," Yeomans said. Processing additional observations in the 2013-2016 time period, he added, "will almost certainly see the impact probability for 2011 AG5 significantly decrease." "Yes, the object 2011 AG5 was much discussed at the AT 14 meetings last week, but perhaps prematurely," said Lindley Johnson, NASA’s NEO Observations Program Executive in Washington, D.C.
Johnson said NEO watchers have flagged the asteroid "as one we should keep an eye on." At present, he said, while researchers have better preliminary orbit data for 2011 AG5 than for many other asteroids in the NEO catalog, "we have only medium confidence in the derived orbital parameters." "Fortunately, we are confident our uncertainties in the current orbit model will be reduced when we will have good observation opportunities in September 2013 with the larger follow-up assets," Johnson told SPACE.com. Observing opportunities are even better, he added, starting in November 2015 and for several months thereafter. "So, rather than a need to immediately jump to space mission solutions, the situation with 2011 AG5 shows the value of finding potentially hazardous objects early enough so that there is time for a methodical approach of observation and assessment as input to any need for an expensive spacecraft mission," Johnson said. "A more robust survey capability would improve the data available to make such assessments." Long-time NEO specialist and former Apollo astronaut Russell Schweickart played an active role in the dialogue about 2011 AG5. He represented the Association of Space Explorers (ASE) Committee on Near Earth Objects and presented to the Action Team an analysis of the situation with 2011 AG5. The space rock presents a "decision challenge" to the international community, Schweickart suggested, "in the unlikely chance that its current low, but significant probability of impacting Earth in 2040 continues to increase after additional tracking becomes available." Schweickart spotlighted a rough Association of Space Explorers analysis of the options to deflect the asteroid in the future, in the unlikely scenario that the Earth impact probability continues to increase. He also provided to the Action Team several new appraisals of options for deflection of asteroid 2011 AG5 to avoid a potentially dangerous Earth encounter in 2040. The key moment of the Don Quijote mission: the Impactor spacecraft (Hidalgo) smashes into the asteroid while observed, from a safe distance, by the Orbiter spacecraft (Sancho). A decision date for a keyhole deflection is very soon, if not now, Schweickart suggested. Asteroid 2011 AG5 represents an actual threat that underscores the need for a NEO hazard decision-making structure within the UN COPUOS, he said. Based on the latest analysis, Schweickart reported, a deflection campaign delayed until after the 2023 close approach appears marginally possible, as long as a decision to commit is made immediately thereafter. In the low-probability case in which the impact threat of the asteroid persists beyond its 2013 apparition, "should a keyhole deflection campaign be foregone — for whatever reason — the international community may be faced with the difficult decision of choosing between an expensive multikinetic impactor or a nuclear explosive to prevent an impact should the NEO indeed pass through the keyhole," Schweickart said. The timelines that would be required to mount a successful deflection of the asteroid, Schweickart told SPACE.com, might be challenging. But first things first — researchers stress that more study of the asteroid’s trajectory is called for. The next tracking opportunities of 2011 AG5 will occur in September 2013, and then again in November 2015. In response to a letter from Schweickart regarding 2011 AG5, NASA Administrator Charles Bolden said that 2011 AG5 is "high on NASA’s list of NEOs to monitor for impact hazard potential," adding that "we take these duties very seriously." Bolden also noted the opportunities for highly accurate ground-based observations in the near future. "Based on these observations, a more informed assessment can then be made on the need for any type of mitigation," he said. Bolden also remarked that the asteroid makes an apparition in 2015, more than seven years before the close keyhole passage in 2023 that could set in motion an Earth impact in the 2040 time frame. "As a point of comparison, NASA’s Deep Impact mission [the Deep Impact probe smashed into comet Tempel 1 in July 2005] was conducted in six years from selection to impact under much less urgency, demonstrating the adequacy of a seven-year period for any necessary response," Bolden said.